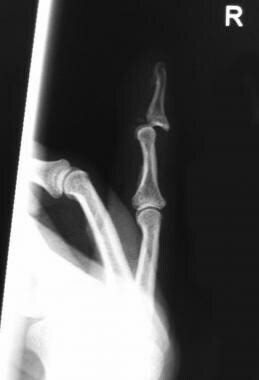 Every emergency physician should have a firm understanding of the acute management of simple dislocations of the digits. Historical, physical, and radiographic findings often guide the management of the dislocation. When the dislocation is complicated, consult with and/or refer to a hand surgeon. Generally, reduced dislocations without evidence of instability and near-normal range of motion can be treated with brief immobilization and subsequent referral. For patients with a hand dislocation who are being transported by emergency medical services (EMS), immobilization of the deformed joint, protection of soft tissue injury, and provision of pain relief are the mainstays of prehospital treatment. Rapid pain relief, obtainment of imaging studies, and expeditious reduction (closed or open) must be the triad that drives the ED protocol for treating isolated digital or hand dislocations. Many patients with an isolated digital or hand dislocation can be expeditiously treated from the time they arrive until the initial physician contact if protocols allow the nursing staff to provide analgesia and order the appropriate radiologic study. Pain management can consist of oral medication, intramuscular injection, intravenous injection or regional anesthesia, if determined to be advisable owing to the severity of injury and the patient's medical history, allergic reaction profile, and expressed comfort level. Oral medication can be problematic if the patient eventually requires open reduction. Therefore, pain management protocols should take this into account. Imaging studies of the affected digit or hand can easily be part of an ED protocol. For example, radiographs of the isolated digit can be obtained if the triage or evaluating nurse assesses the patient to have a deformity at the distal or proximal finger joints. Once a hand dislocation is identified and pain control is initiated, then relocation is the next step in patient care. Most hand dislocations are easily reduced by the emergency physician. Some dislocations may not be reducible by closed means because of the interposition of the volar plate or associated ligaments or tendons in the joint. If several attempts at reduction are not successful, consultation and open reduction and internal fixation (ORIF) often is indicated. [7, 8] A thorough assessment of stability should be performed following a successful reduction. The distal interphalangeal (DIP) joint of the finger is a very vulnerable area. Surprisingly, dislocations in this area are uncommon because of the strong support of the joint by skin and periarticular structures. The strong support network is unyielding, however, and if the appropriate intensity of force is applied, the skin may tear, leading to an open dislocation. A DIP dislocation is shown below. Dorsal distal interphalangeal (DIP) joint finger dislocation (lateral view). Note small fracture fragments. Reduce the dislocation with longitudinal traction and hyperextension, with firm dorsal pressure on the base of the distal phalanx. Open reduction rarely is needed in this type of dislocation. Dorsal dislocations are reduced by applying longitudinal traction and mild hyperextension with dorsal pressure on the proximal aspect of the middle phalanx. Volar dislocation of the proximal interphalangeal (PIP) joint of a finger is relatively uncommon. When a volar dislocation occurs, the proximal phalanx can rupture through the transverse retinacular fibers between the lateral band and the central tendon. The lateral bands may become interposed, making closed reduction difficult. If the volar plate is ruptured and the extensor mechanism avulsed, a Boutonnière deformity may result. Open reductions normally are performed for these injuries. Occasionally, closed reduction may be performed. If the joint remains stable, immobilize the digit briefly in a slightly flexed position. Dislocation of a metacarpophalangeal (MCP) joint of the fingers most often involves the index or small finger. Dislocations here are relatively uncommon because of the strength of the periarticular structures. Dislocations may be simple or complex. A complex dislocation nearly always needs open reduction because of an interposed volar plate. Closed reduction may be accomplished by using traction along the axis of the hyperextended phalanx and firmly pushing the base of the dislocated phalanx toward the MCP joint. Assess the stability of the joint after reduction and follow the procedure by immobilization. Some controversy exists regarding the length of time and position of immobilization. Some authors recommend early range of motion if no evidence of postreduction instability is observed. Reductions of this joint usually are accomplished via closed means. This particular dislocation may present with associated rupture of flexor pollicis longus. Following evaluation and reduction, immobilize the involved joint with a thumb spica splint. The period of joint immobilization should be brief to avoid joint stiffening. Anterior dislocations of the MCP joint of the thumb are classified as simple or complex. The appropriate method of reduction of a dislocation depends on the type of dislocation. A thumb MCP dislocation is shown in the image below. Thumb metacarpophalangeal (MCP) joint dislocation. Image courtesy of David T. Schwartz, MD. For simple dislocations, the clinician should avoid pure traction, as this can convert a simple dislocation into a complex one. Reduction is achieved by emphasis of pushing the phalanx into the MCP joint rather than by pulling it into place. If 1-2 attempts at reduction are unsuccessful, an open reduction must be performed. More aggressive and repeated attempts at reduction may lead to fracture. An interposed volar plate or intrinsic muscle may be the reason for failed attempts at closed reduction. After the dislocation is reduced, immobilize the joint with a thumb spica splint. The length of immobilization varies, but clinicians should avoid extended immobilization and minimize immobilization of unaffected areas. Patients treated and discharged from the ED should have oral analgesia prescribed as part of their outpatient care. Patients with dislocations that are not reducible in the ED should have their disposition discussed with a hand specialist. If one is not immediately available, the patient may need to be transferred to a facility with a higher level of care. Patients with open joints or other significant hand injuries usually require admission. Complex and open dislocations should be evaluated by a hand surgeon for open reduction. In addition, those individuals with fracture-related dislocation require further evaluation by a hand surgeon. Patients should be referred to a hand specialist following treatment of hand dislocations. Gaheer RS, Ferdinand RD. Fracture dislocation of carpometacarpal joints: a missed injury. Orthopedics. 2011 May. 34(5):399. [Medline]. Shah CM, Sommerkamp TG. 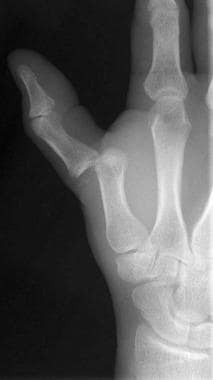 Fracture dislocation of the finger joints. J Hand Surg Am. 2014 Apr. 39 (4):792-802. [Medline]. Frick L, Mezzadri G, Yzem I, Plotard F, Herzberg G. [Acute carpometacarpal joint dislocation of the long fingers: study of 100 cases]. Chir Main. 2011 Oct. 30 (5):333-9. [Medline]. Prucz RB, Friedrich JB. Finger joint injuries. Clin Sports Med. 2015 Jan. 34 (1):99-116. [Medline]. Ikeda M, Ishii T, Kobayashi Y, Mochida J, Saito I, Oka Y. Percutaneous pinning of the displaced volar plate avulsion fracture of the PIP joint. Hand Surg. 2009. 14(2-3):113-9. [Medline]. Durakbasa O, Guneri B. The volar surgical approach in complex dorsal metacarpophalangeal dislocations. Injury. 2009 Jun. 40(6):657-9. [Medline]. Weber DM, Kellenberger CJ, Meuli M. Conservative treatment of stable volar plate injuries of the proximal interphalangeal joint in children and adolescents: a prospective study. Pediatr Emerg Care. 2009 Sep. 25(9):547-9. [Medline]. Lutz M, Fritz D, Arora R, et al. Anatomical basis for functional treatment of dorsolateral dislocation of the proximal interphalangeal joint. Clin Anat. 2004 May. 17(4):303-7. [Medline].